Academia.edu has received roughly 2,800 takedown notices from Elsevier for copyright infringement, reported by The Chronicle of Higher Education late last week. Academia.edu is a social network for academics to “share research papers” and has over 6 million registered users. Users of the site can create a profile, identify their institution and research interests, and upload their papers and CV to share among their peers. However, when an author publishes a paper in a journal, the journal publisher oftentimes requires an agreement that transfers copyright ownership of the paper to the publisher and restricts the unauthorized distribution of that paper. In this case, Elsevier, a major academic publisher, is compelling Academic.edu to remove papers for which Elsevier owns the copyright. This addendum can be attached to any publishing agreement that requires the transfer of copyright for a scholarly journal article. The agreement is similar to the licensing agreements that are freely available from Creative Commons and are commonly applied by Open Access publishers like the Public Library of Science, PeerJ, and Open Humanities Press. For more information about the Author’s Addendum or Open Access publishing, contact your department librarian. The sharing of research is fundamental to the advancement of ideas and negotiating for more equitable rights to your work helps ensure that this practice continues in your favor. Open Access Week 2013 begins today, and all week we’ll be running posts by guest bloggers on open access and contemporary scholarship in the Humanities. Today’s post comes from Stephen Ramsay, Associate Professor of English at the University of Nebraska-Lincoln. Professor Ramsay is the University of Iowa’s open access guest-scholar this year, and he will be delivering a lecture, “What is a Publisher?” at 2 pm in the Illinois Room (room 348) of the IMU today, Monday, October 21st. He will also be participating in a panel discussion on open access and trends in academic publishing Tuesday, October 22, at 3 pm in Room 1117 of the University Capitol Centre. Find more details here about these events and Open Access Week at the University of Iowa. We hope you’ll join us. I’m going to risk a certain immodesty by talking, in rather self-aggrandizing terms, about an essay of mine called “The Hermeneutics of Screwing Around; or What You Do With a Million Books“. This essay began as a talk I gave at Brown University in 2010. The talk was a bit rough, but reasonably well received. Later on that year, I was invited to a workshop in Niagara-on-the-Lake, Ontario (the organizers had taken advantage of off-season rates to hold it in a stunningly beautiful resort town). The workshop was called “Playing with Technology in History” (later rebranded as “PastPlay”) and focused on bringing notions of play and the ludic (using, for example, role-playing games, Arduino boards, and even Lego bricks) to teach history. The plan was that we would spend a day playing games, hacking things, and participating in other sorts of activities — in other words, trying things out and exchanging ideas to see what might work and what might not. On the second day, though, we would get down to business. We were all supposed to bring an essay to be workshopped in traditional seminar format. University of New Brunswick Press had agreed to publish the resulting volume (subject to the usual terms of peer review). So, I revised my essay from Brown — making it a bit less “talky” — and submitted it to the group. Reactions were, I thought, more positive this time, though one participant told me I was dead wrong on one particular point. He was right; I fixed it, and fiddled with it some more. Publishing takes a while, as we all know, but being generally anarchic digital humanists, we all agreed that it would be a good idea to put all the essays online in advance of them being formally published. That essay is now, far and away, the most successful thing I’ve ever written. It has been cited countless times, is a regular feature on course syllabi throughout the land, and was even discussed at some length by Stanley Fish on the New York Times “Opinionator” blog. But here’s the thing. It is 2013 — three years later — and that essay still hasn’t been published. Now, there are several reasons for this, none of which includes lassitude on the part of the workshop organizers. Nonetheless, when I write my annual review, I still list it as “forthcoming,” which means that it doesn’t yet “count” as something next to which my department can put a check mark. It’s not yet accepted as one of my “scholarly accomplishments.” The question, therefore, is whether I should actually care about this. In one sense, the answer is “yes.” Academics tend to think of success as adding to the list of items on their CV, and this one still isn’t on mine. On the other hand, this essay made me famous (not Miley Cyrus famous, but you know what I mean). To be more precise, it gave me readers — people who actually care what I have to say. I cannot possibly communicate my astonishment that this happened. For years now, I have been putting everything I’ve ever written online (or rather, everything I can legally put online). I don’t really know why this one caught fire. “Hermenutics” isn’t, I suspect, high on the list of most-googled terms, and while “screwing around” likely is, I imagine that most in search of content related to the latter are disappointed by the marked lack of prurience in a piece that mostly talks about libraries. On the other hand, it shouldn’t have surprised me at all. For years, I had been tweeting things like, “Hey everybody! New blog post!” As with spam, someone always has to investigate further. But even if that response rate is minuscule, the effect might be just as the old shampoo ad put it: “I told two friends. And they told two friends. And so on and so on . . .” After a while, people started to read other things I’d written. I’m uncomfortable telling this story, because it sounds like any number of absurd narratives (“rags to riches,” “the entrepreneurial spirit,” and so forth). But I cannot deny a very important aspect of this tale: it happened because the piece was open and online. It was, in other words, open access. These days, we are likely to speak of open access in terms of the economics of publishing and libraries. Occasionally, we speak of open access as a way to make scholars’ work available to a wider public. What is seldom discussed, though, is the role of naked self-interest on the part of academics. If you’re interested in having readers (and you should be), does it really make sense to bury your work in the stacks of a research library to be discovered by the six graduate students who find it while researching “Hermeneutics–Data Processing”? Back when I started working on digital libraries (as a graduate student, not too long after the Web appeared), one often heard professors talking about their fear of having their work “stolen” if they put it online. Twenty years on, one still hears it from time to time. We used to say, “You should be so lucky!” My work wasn’t stolen (so far as I know), but one thing I know for sure: I was so lucky, and I certainly wouldn’t have been if I hadn’t put it out there for all to see. Hopefully, it will never be published. Stephen Ramsay is Susan J. Rosowski Associate University Professor of English at the University of Nebraska-Lincoln and a Fellow at the Center for Digital Research in the Humanities. He is interested in the digital humanities, theories of new media, theater history, applying computational methods to humanities scholarship, and designing and building text technologies for humanist scholars. His publications include Reading Machines: Toward an Algorithmic Criticism (University of Illinois Press, 2011) and, with Patrick Juola, the forthcoming Mathematics for the Humanist (Oxford University Press). Open Access journals are peer-reviewed and are freely available online to students, researchers, and the general public. As an alternative to the subscription-based model, Open Access publishing removes access barriers to increase the availability and impact of scholarly literature. 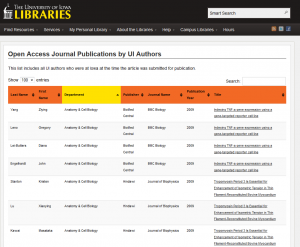 University of Iowa authors have been publishing in Open Access journals since 2006. While Open Access journals provide free access to their content, they are not always free to publish. Some journals, particularly in the sciences, charge article-processing fees to cover the costs of publishing. Luckily, the Universities Libraries and the Office of the Provost have established the Open Access Fund to cover these fees. Not sure if Open Access is right for you? Browse this table of University of Iowa Open Access publications and consider if this route is right for you. In a long piece online at its web site, Simon Owens of US News and World Report offers an overview of academic (chiefly scientific) journal publishing and the rise of open access. See “Is the Academic Publishing Industry on the Verge of Disruption?” Starting with the recent Harvard letter on journal prices (see Transitions for April 23, 2012), the article reports on moves toward open access publishing, and resistance from commercial “closed access” publishers.